Commercial pet food is serious business. There are a lot of viewpoints out there about what exactly is best. Here are a few things you may not know. What you don’t know might hurt your pet. Pet food is serious business. There are a lot of viewpoints out there about what exactly is best. Despite all the differences in diets, there are some things in common. 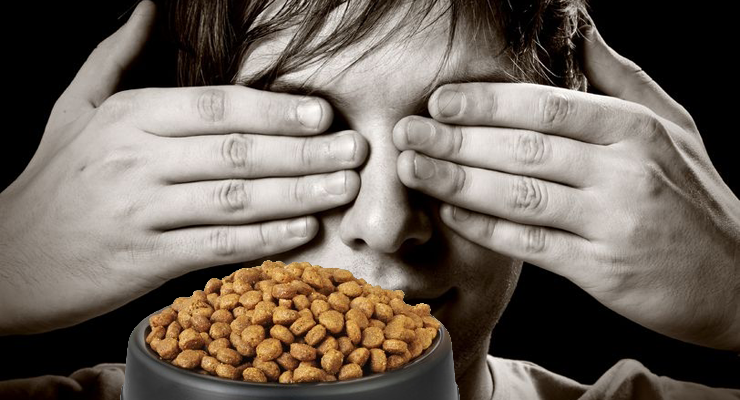 Following is my personal list of 6 things most commercial pet food companies don’t want people to know. 1. Animal fat could come from some unsavory places. It’s hard to wrap our heads around what the generic-sounding phrase “animal fat” really means. Many nutrition labels are full of misleading terms and words that, like “animal fat,” are vague — and also just plain unpronounceable. According to AAFCO (the Association of American Feed Control Officers), animal fat is “obtained from the tissues of mammals and/or poultry in the commercial processes of rendering or extracting.” Many people believe that definition could refer to just about anything — including (brace yourself) euthanized animals, slaughterhouse waste and roadkill. Instead, look for specifically named meat sources such as beef, chicken and turkey. 2. Fillers can be split up on the label to give the impression of a lower quantity. When you’re looking at a pet food ingredient label, be sure to look at all the ingredients. Foods are listed in order of percentage of content. However, some pet food manufacturers try to make certain content look lower by breaking it up into different named categories. 3. The name on the bag isn’t always the actual manufacturer’s. A pet food company is not always its own manufacturer. It can be tricky in some cases to figure out which companies use which manufacturers. Diamond Pet Foods, for example, manufactures Apex, Solid Gold, Premium Edge, Chicken Soup for the Pet Lover’s Soul, Kirkland, 4Health and Taste of the Wild, among other brands. In some cases, particularly in companies with more negative publicity and customer feedback, companies will not be completely open about their manufacturer. The information is always out there, but you have to dig for it. Manufacturers are a critical part of the pet food decision-making process. 4. Veterinary endorsements don’t equal quality. Simply seeing the words “Veterinarian Recommended,” “Veterinarian Formulated” or “Veterinarian Developed” on a bag of pet food is not sufficient reason to buy without checking the nutrition label closely. Some pet food companies don’t tell you which veterinarian is endorsing their food. It could certainly be a reputable veterinarian — or maybe not. Use good judgment, and don’t be swayed by clever marketing tactics. Per AAFCO, pet foods are technically not allowed to put “Veterinarian Approved” on their food bags — simply because veterinarians do not have the authority to “approve” food. That power rests with state and federal laws. 5. Preservatives may cause cancer. Preservatives are never really a good idea, but this one is on the Office of Environmental Health Hazard Assessment of the State of California’s list of chemicals known to cause cancer. Granted, it’s not there in huge amounts — and there is some debate about this — but I have to worry about the effect over time. We do feed our pets daily, after all. 6. Not all “people food” is bad. I know, I know — I was raised with the same mentality that feeding Fido from the table would cause him to keel over instantly. And there are some foods that you should never feed your dog, such as chocolate, raisins and garlic/onions. But it’s possible to make your own pet food at home. Using fresh meats and vegetables, with guidance from your vet, you will have control over what your pet consumes. In some cases, this is cheaper. I used to cook homemade meals for my pup, Gypsy. In short, become an engaged pet parent. Learn the specifics of the labels. Pet food companies have to list all their ingredients. Everything you need to know is right there on the label, but deciphering it can be tricky.